IPhone apps are good for keeping most of us occupied and well out of the dangerous sphere of social interaction, but how awesome would it be if you could use your iPhone as a controller for a real-world game? This drone, created by Bluetooth headset company Parrot (yeah, we don’t get it, either) is controlled by your iPhone and can take you head-first into an awesome augmented reality airborne war game. We want it. Now. The on-board computer communicates with your iPhone and uses its own internal accelerometers to bob and weave through the air. 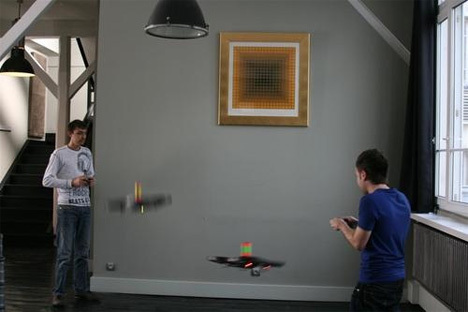 The drone is equipped with WiFi so you can challenge your friends to a real-life game of augmented-reality destruction. Two cameras, one on the front and one on the bottom, transmit the drone’s surroundings to your iPod display, where target information is overlaid on the video feed. 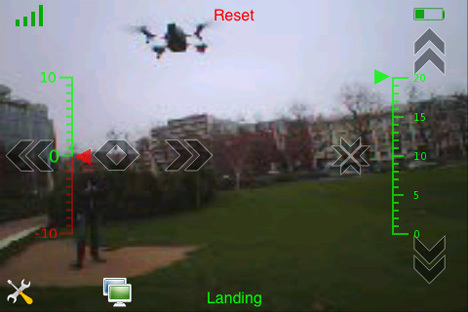 You simply move your iPhone to control ther drone. There’s typically a slight lag with the camera-based augmented reality gaps, so we wonder how accurate the controls would actually be. Four propellers keep the drone in the air, and a removable bumper helps keep the (presumably expensive) toy relatively safe from harm. Parrot hasn’t released much information yet, so no word on how much it’ll cost or when/where you can pick one up. But when they’re available, we would crawl over our own mothers to get one. 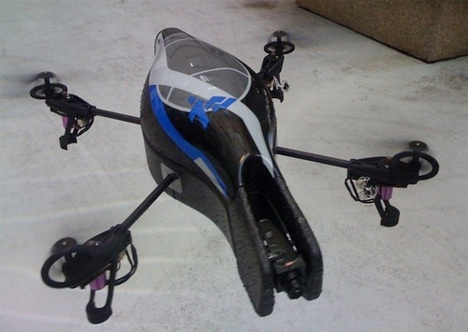 See a short video of the drone in action at Gizmodo. See more in Phones & Mobile or under Gadgets. January, 2010.